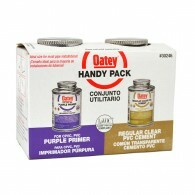 Subscribe to our free e-newsletter for coupon codes and site updates. 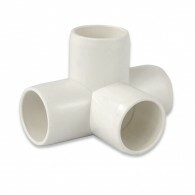 PEX Cutter - Cuts Up to 1"
An introduction to PVCFittingsOnline.com, offering a wide range of PVC fittings and pipe products in a wide range of styles and prices. If you like our video, please share it! 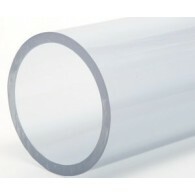 2" Clear Schedule 40 PVC Pipe - 5 ft.
3/4" Furniture Grade PVC Fitting Connector. NOT MEANT FOR PLUMBING. 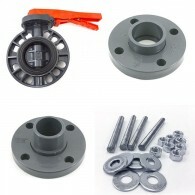 2" Furniture Grade PVC Fitting Connector. NOT MEANT FOR PLUMBING. PVC or polyvinyl chloride is a versatile material used for pipes, tubing and fittings for transporting liquids. It is suitable for applications where the temperature of the liquid does not exceed 140°F, above this temperature it may soften and lose its shape. CPVC is an improved version containing chlorine which gives it additional resistance to heat and corrosion making it suitable for a greater range of applications. CPVC can be used at temperatures up to about 200°F without losing its shape. Because it is less reactive than PVC it can be used for transporting highly corrosive chemicals and is suitable for drinking water. Within these general categories, PVC fittings are grouped into schedules or thicknesses. There are many schedules, but the most common are 40, 80 and 120. Schedule 40 PVC fittings are usually white or tan. This size has the greatest inside diameter of the schedules and is often used for carrying cold water. It can only contain liquids with a temperature of 140°F or less. Schedule 80 has a smaller inside diameter than schedule 40 because its walls are thicker. This makes it suitable for carrying greater pressures than schedule 40 and gives it a higher temperature rating. Fittings made from schedule 80 are often used in larger buildings rather than private homes, though there are exceptions. Schedule 80 fittings are usually gray. Schedule 120 has the smallest inside diameter because its walls are thickest. 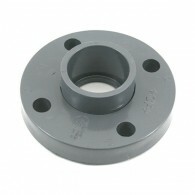 It is capable of carrying high pressures, making it suitable for commercial locations. Schedule 120 is rarely used in residences because of its expense and because it has more pressure capacity than is needed in most residential locations. PVC fittings used specifically for waste water are sometimes called DWV (drain, waste and vent) fittings. PVC fittings are often white, tan or gray, but green, blue and yellow are also seen. There is no set meaning for these colors, though white and gray are most often seen in plumbing applications, and green is often used for sewage.